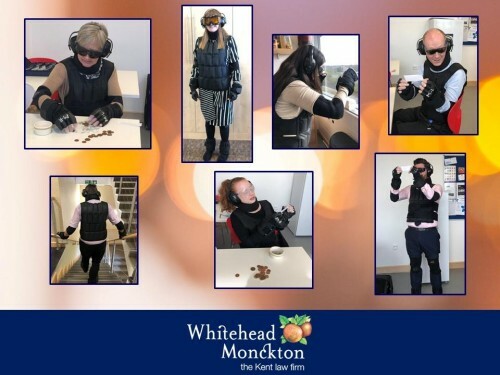 This week, Kent County Council kindly gave Whitehead Monckton’s Maidstone office the opportunity to borrow an age simulation suit (GERT) which mimics some of the difficulties faced by some elderly people. The weights restrict movement, cause slouching and replicate joint stiffness and the ear plugs and defenders block out sound whereas the various glasses reduce vision and imitate different sight impairments such as severe cataracts or tunnel vision. Members of staff volunteered to undertake some everyday tasks whilst wearing the suit, with their experience guided by two members of our Tax and Estate Planning team, Amy Turner-Ives and Bekka Fuszard. The first task was given to participants verbally. The task involved sitting down at a table and sorting some coins and paperclips which were in a small pot. Most of the participants had to be told the task three or four times before they could grasp what was being asked of them. Commercial Property Solicitor Paula Mestre completely missed the first task as she was unable to hear the instructions. Paula wished to experience the age suit to increase her understanding and tolerance for her mother (who has a hearing aid and walks with a stick). Providing feedback at the end of her experience, Paula said “I think everyone should have a go at this so they can appreciate the challenges others face day to day”. 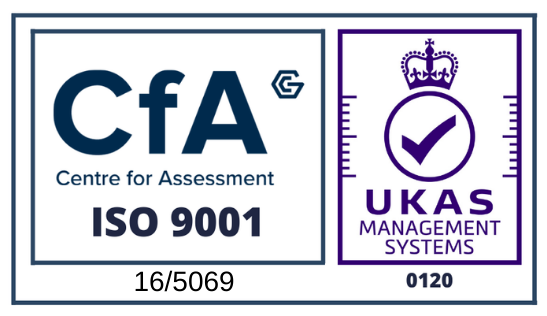 The second task was to retrieve something from the bottom shelf of the staff fridge, followed by walking into the open plan office and getting a yellow file from the stationary cupboard. The fourth task was to walk up and down a flight of stairs. Court of Protection Assistant Elyse Palmer, who was one of our youngest participants, found walking up and down the stairs the most difficult of all the tasks. Lastly, participants were taken outside to our staff carpark to get in and out of a car. Daniel Brent, Financial Planner, was completely oblivious to the loud police sirens that could be heard from the nearby road on exiting the building. Family Solicitor Jonathan Miller experienced issues with depth perception when assessing where the curb stopped and the road started, finding it almost impossible to see. All participants said that the experience changed their perception of the challenges some older people face on a day to day basis. Marketing Assistant, Callum Wadlan commented that he will now be more patient with his family and older people when they are walking slowly or cannot see things clearly. Conveyancing Executive Debbie Tree said that it was a good exercise and she will now be more considerate towards the elderly. Amy Turner-Ives, who also wore the suit, commented “even though my first concerns were about how silly I looked and the sheer weight of the equipment, these soon dissipated when I realised how much of a difference it made to my vision, mobility and especially my hearing! Wearing the suit, even just for a short period of time, has definitely increased my understanding of what the older generation have to deal with on a daily basis”.